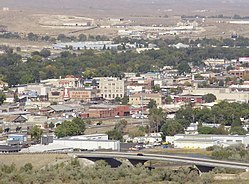 Elko is the principal city of the Elko Micropolitan Statistical Area, a micropolitan area that covers Elko and Eureka counties. It is the largest city for over 130 miles (210 km) in all directions, making it, as its city motto states, "The Heart of Northeast Nevada". Coordinates: 40°50′N 115°46′W﻿ / ﻿40.833°N 115.767°W﻿ / 40.833; -115.767 Elko (Shoshoni: Natakkoa, "Rocks Piled on One Another") is the largest city in and county seat of Elko County, Nevada, United States. The population was 18,297 at the 2010 census. The city straddles the Humboldt River. It is home to Great Basin College, as well as to the National Weather Service Weather Forecast Office serving most of northern and central Nevada. Elko was settled with the coming of the railroad, which still runs past downtown Elko near the Humboldt River. Though Elko lies along the route of the historic California Trail, it was first inhabited only in 1868, when it was at the east end of the railroad tracks built by the Central Pacific Railroad (the portion of the First Transcontinental Railroad built from California to Utah). When the railroad crews moved on, Elko remained, serving as a center for ranching, mining, rail freight and general supplies. Elko is said to have been named by Charles Crocker, a superintendent of the Central Pacific Railroad. He was especially fond of animal names and added the letter "o" to Elk. There is no definitive evidence of this naming history, but it has become the widely accepted version. The first Elko County Courthouse was built in 1869. Elko was officially incorporated as a city in 1917. In 1925, the Kelly Act (also known as the Airmail Act of 1925) authorized the United States Postal Service to contract with private airlines for the feeder routes that fed the main transcontinental route. The first commercial airmail flight in the United States was on the 487-mile (784 km) Airmail Route #5 from Pasco, Washington, to what would become Elko Regional Airport on April 6, 1926. The flight was piloted by Leon D. Cuddeback and included a brief stop in Boise, Idaho, to pick up more mail. The 1910 replacement for the original courthouse is listed on the National Register of Historic Places. The U.S. Post Office-Elko Main, built in 1933, is also listed. 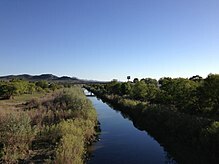 According to the United States Census Bureau, the city has a total area of 17.6 square miles (45.7 km2), all land, though the path of the Humboldt River fills from time to time. Elko's climate is semi-arid (Köppen climate classification BSk). January is normally the coldest month of the year, with a daily average temperature of 25.1 °F or −3.8 °C, and July the hottest of the year, with a daily average of 70.2 °F or 21.2 °C. There are an average of 1.8 days with 100 °F or 37.8 °C highs, 44 days of 90 °F or 32.2 °C highs, 24 days that do not top freezing, 198 nights with freezing lows, and 12 nights with sub-0 °F (−17.8 °C) lows; the growing season here is short, as the average window for freezing temperatures is September 10 through June 9. Annual precipitation averages 9.89 inches or 251.2 millimetres, falling on an average of 81 days, while annual snowfall averages 41.5 inches or 1.05 metres. There are normally 130 sunny days each year. The highest temperature on record is 107 °F or 41.7 °C, most recently on July 4, 1981, and the lowest on record is −43 °F or −41.7 °C on January 21, 1937. The most rainfall in 24 hours was 4.13 inches (104.9 mm) on August 27, 1970, and the most precipitation in one month 5.71 inches (145.0 mm) – all as snow – in January 1916. The most rainfall in one calendar year was 18.34 inches (465.8 mm) in 1983, and the least 4.35 inches (110.5 mm) in 1919, though from July 1923 to June 1924 only 3.72 inches (94.5 mm) was recorded. The most snowfall in one month was 69.0 inches (1.75 m) in January 1890, with the most in one season being more than 91.00 inches (2.31 m) from July 1889 to June 1890 (some days being missing) and the least 6.00 inches (0.15 m) from July 1939 to June 1940. The greatest depth of snow on the ground was 24 inches or 0.61 metres on February 5, 1932, though an average winter will see a maximum snow cover of 7 inches or 0.18 metres. As of the census of 2000, there were 16,708 people, 6,200 households, and 4,216 families residing in the city. The population density was 1,153.3 people per square mile (445.2/km²). There were 6,948 housing units at an average density of 479.6 per square mile (185.1/km²). The racial makeup of the city was 83.16% White, 0.37% Black, 2.66% Native American, 1.12% Asian, 0.12% Pacific Islander, 9.63% from other races, and 2.94% from two or more races. Hispanic or Latino of any race were 21.12% of the population. There were 6,200 households out of which 39.2% had children under the age of 18 living with them, 53.5% were married couples living together, 9.1% had a female householder with no husband present, and 32.0% were non-families. 24.5% of all households were made up of individuals and 6.3% had someone living alone who was 65 years of age or older. The average household size was 2.66 and the average family size was 3.24. In the city, the population was spread out with 30.3% under the age of 18, 9.8% from 18 to 24, 31.2% from 25 to 44, 21.0% from 45 to 64, and 7.6% who were 65 years of age or older. The median age was 32 years. For every 100 females, there were 104.6 males. For every 100 females age 18 and over, there were 105.3 males. The median income for a household in the city was $48,608, and the median income for a family was $52,754. Males had a median income of $43,397 versus $27,366 for females. The per capita income for the city was $20,101. About 6.1% of families and 8.2% of the population were below the poverty line, including 8.9% of those under age 18 and 8.4% of those age 65 or over. Elko's economy is based heavily on gold mining, with ranching and tourism providing additional jobs. The city is considered the capital of Nevada's goldbelt. The state of Nevada produces more gold than all but four countries, and most of the gold from Nevada is mined near Elko. This has caused the town to have a boom and bust economy consistent with the rises and declines in the price of gold. The town is surrounded by hundreds of abandoned mining camps, and viewing them is a popular local activity. A gold boom in the 1980s that ended in a bust in the late 1990s left the town with large numbers of abandoned homes and left the local governments struggling to survive on reduced tax revenues. With a new gold boom starting in 2009, city officials have been reluctant to hire new employees and have decided to build a reserve in the city budget to prepare for the next bust. Elko has struggled to bring in other industries, mostly because of its isolation and the surrounding harsh desert environment. Hunter S. Thompson quipped that in Elko, "The federal government owns 90% of this land, and most of it is useless for anything except weapons testing and poison-gas experiments." Elko has been the home of the annual National Cowboy Poetry Gathering for the last 33 years. This festival is held each January and is a week-long celebration of life in the rural West, featuring poetry, music, stories, gear, film, photography, and food. Every July, since 1963, Elko is host to the National Basque Festival. In 2013 they were scheduled to celebrate their 50th anniversary. Humorously referred to as the "Basquo Fiasco", it is a celebration of traditional Basque culture and its ties to the Elko community. The festival includes strongman competitions, handball, a running of the bulls, traditional food and wine, and Basque dancing. Elko is the home of the Western Folklife Center, a regional nonprofit organization that works to expand understanding of the everyday traditions of people who live and work in the American West. The Western Folklife Center is downtown in the old Pioneer Hotel. A number of casinos are located in Elko, including Stockmen's Casino and Hotel, the Commercial Casino, the High Desert Casino, Gold Dust West, the Red Lion Casino, and the Gold County Inn and Casino. The Commercial Casino is notable for having a stuffed 10-foot-tall (3.0 m) polar bear on display. For many years the Red Lion brought gamblers to Elko from many parts of the country through flights on Casino Express. The flights to Elko ended in February 2006. Elko is also home to legal prostitutes and contains active brothels. Under Nevada law, any county with a population of less than 400,000 is allowed to license brothels if it so chooses. Several geothermal features can be found in Elko, the largest of which is the Elko Hot Hole. Hot springs were used by travelers on the California Trail and subsequently by settlers. Notable attractions in the Elko region include the Ruby Mountains, in which is the popular Lamoille Canyon. To the north, the Jarbidge Wilderness is among the least visited and cleanest wilderness areas in the United States. Elko is the largest city between Salt Lake City and Reno, located along Interstate 80. Nevada State Route 225 (Mountain City Highway) connects Elko to Owyhee and southern Idaho, while Nevada State Route 227 (Lamoille Highway) extends southeast to Spring Creek and Lamoille. Passenger bus service to Elko is available on Greyhound Lines, while Amtrak's daily California Zephyr provides train passenger service via Elko Station. SkyWest Airlines, operating as Delta Connection, serves Elko Regional Airport (EKO) with regional jet service nonstop to the Delta Air Lines hub in Salt Lake City (SLC). Elko was once the home base of a jet air carrier, Casino Express Airlines, which operated Boeing 737-200 jetliners to many cities in the U.S. on a scheduled charter basis in support of the local casino industry. Casino Express changed its name to Xtra Airways and relocated its headquarters in June, 2010 to Boise, Idaho and again in May, 2015 to Coral Gables, Florida. Elko also was previously served by United Airlines with scheduled passenger jet service during the 1970s and early 1980s. According to Official Airline Guide (OAG) flight schedules as well as the airline's system timetables, United operated Boeing 737-200 jetliners into the Elko Regional Airport on a year-round basis with a daily round trip routing of San Francisco (SFO)-Reno (RNO)-Elko (EKO)-Ely (ELY)-Salt Lake City (SLC). United eventually discontinued all flights into Elko after serving the airport for over 50 years. ^ "Welcome to the City of Elko". Ci.elko.nv.us. Retrieved September 12, 2013. ^ a b "Profile for Elko, Nevada, NV". ePodunk. Retrieved September 26, 2012. ^ a b "Geographic Identifiers: 2010 Demographic Profile Data (G001): Elko city, Nevada". U.S. Census Bureau, American Factfinder. Retrieved February 16, 2016. ^ MICROPOLITAN STATISTICAL AREAS AND COMPONENTS Archived June 29, 2007, at the Wayback Machine, Office of Management and Budget, 2007-05-11. Accessed 2008-07-27. ^ a b Hickson, Howard (Fall 1983). "Elko, Nevada: 1868-1968". Northeastern Nevada Historical Society Quarterly. 83 (4). ^ Federal Writers' Project (1941). Origin of Place Names: Nevada (PDF). W.P.A. p. 24. ^ Hickson, Howard (Fall 1970). "Dirt Runways: Elko Airport - The Early Years (1919-1926)". Northeastern Nevada Historical Society Quarterly. 1 (2). ^ "ELKO WB AIRPORT, NEVADA - Climate Summary". wrcc.dri.edu. Retrieved June 6, 2010. ^ "NowData - NOAA Online Weather Data". National Oceanic and Atmospheric Administration. Retrieved April 18, 2012. ^ a b Ashley Powers (September 20, 2011). "Elko, Nev., takes the gold boom with a grain of doubt". Los Angeles Times. Retrieved September 23, 2011. ^ "Western Folklife Center - National Cowboy Poetry Gathering Home Page". westernfolklife.org. Archived from the original on March 17, 2010. Retrieved June 6, 2010. ^ "Elko Convention and Visitors Authority, Elko Nevada". elkocva.com. Archived from the original on January 11, 2010. Retrieved June 6, 2010. ^ "Western Folklife Center - Home". westernfolklife.org. Retrieved June 6, 2010. ^ "NRS: CHAPTER 244 - COUNTIES: GOVERNMENT". leg.state.nv.us. Retrieved June 6, 2010. ^ "Elko Hot Springs". University of Nevada-Reno. Archived from the original on July 14, 2007. Retrieved June 18, 2014. ^ "Nevada Governor Lewis Rice Bradley". National Governors Association. Retrieved September 26, 2012. ^ "Tim Gilligan". justsportsstats.com. Retrieved November 6, 2015. ^ Larry Rodgers "DJ diary Valley radio legend Dave Pratt's new autobiography has charitable spin." The Arizona Republic. Nov. 18, 2008. Wikimedia Commons has media related to Elko, Nevada. Wikivoyage has a travel guide for Elko.